The bitumen tar sands are located in three areas of Alberta, Canada and have become a major global source for fossil fuel extraction. Bitumen has a different composition than conventional oil, making it more expensive, difficult, and harmful to extract as well as transport. The differences between bitumen and conventional crude oil make bitumen a greater risk to the environment and local communities, due to the more extreme methods needed to transform the tar-like substance into a more easily used liquid state. This page will serve as a resource for information about bitumen, its history, extraction process, environmental and human health implications, and commercial uses. Bitumen is a type of oil which is physically similar to tar or molasses in consistency while at room temperature. About 80% of bitumen is found deep in the ground “at a depth of greater than 75m,” or 246 feet (Schamel). When extracted, it is mixed with quartz sand, which can be seen in the hands of a worker in the above photo. Bitumen has a range of compositions, however it is usually composed of “hydrocarbons…as well as many more impurities, such as nitrogen, sulphur and heavy metals” (Gray). Bitumen is thought to originate from algae and small sea creatures trapped in the ground for millions of years, eventually turning into petroleum (Oil Sands Discovery Center). To enable liquid-like characteristics, bitumen must be heated with high pressure steam that is 360 degrees C, or 680 degrees F (Regional Aquatics). Because bitumen is denser and more tar-like in its consistency, it is extracted differently than conventional crude oil, which is directly pumped from the ground. An oil field expert explains how bitumen is “more like a solid, like tar, than conventional oil which makes it hard to pump. Extraction is a much dirtier, energy intensive and a more expensive process” (Ramel). Once bitumen has been extracted it is shipped to refineries. The solutions used to dilute the bitumen are usually considered a trade secret, although they can usually be found to contain natural gas condensate, naphtha, or a mix of other hydrocarbons (API). The refining processes release dangerous pollutants including benzene and styrene, which are also known carcinogens (Bailey). Bitumen can be found around the world, and is a relatively new source of fuel for North America, beginning to be tapped in northern Alberta in 1967 (Gray). Bitumen in Alberta constitutes the third largest oil reserve in the world (Alberta) (See Alberta Tar Sands). Bitumen’s tar-like consistency has historically been used as a fix-all. It is and has been used for many thousands of years as a means of waterproofing, patching, gluing, asphalting, and building. Bitumen has been found as long ago as 6000 BC, when "the thriving ship-building industry in Sumeria used naturally occurring Bitumen found in surface seepage in the area” (Bitumen Association). Bitumen was not used as an oil product until “the early 1900s in the United States, giving rise to a myriad of contemporary industrial uses” (Bitumen Association). Bitumen is found across the globe; Shell alone has ten sites in Europe, four in Asia, one in Africa, and two in the Americas (Shell). Although Alberta is the third largest oil reserve in the world, it is the largest reserve of Bitumen, producing 1.8 million barrels a day. In comparison, Venezuela is also considered to be a large reserve and produces 300,000 barrels a day (Fuel Chemistry). Historically, Indigenous and low-income communities are disproportionately impacted by the spills, chemicals released during processing, and destruction of natural resources (See Low Income). On top of the environmental and health implications, the geography of the oil sites, refineries, pipelines and railways are often located near Indigenous, minority, and low-income communities (NRDC). The large drilling corporations ignore the concerns of Indigenous communities that lack the resources to fight back. In Alberta “Industries seeking to develop land and extract resources are increasingly turning to Indigenous territories to develop and seek profits on the land and environment upon which such communities are so often dependent for survival” (Marshall). Bitumen is becoming a more popular option in North America due to its large quantity, other dwindling conventional oil sites, and prospects for employment. The Bitumen extraction process is long and arduous, especially when compared with conventional oil methods. Traditionally, when Bitumen is located close to the surface, it can be mined via mechanization and on-the-ground methods. Only 20 percent of deposits lie near the surface (Truthloader). In the Athabasca tar sands, large machinery moves 56 yards per shovel load, and place them into trucks capable of holding 400 tons at a time. Otherwise, if Bitumen is located too far beneath the surface for traditional surface mining techniques, it is excavated using steam injection methods. This takes the form of either Cyclic Steam Stimulation (CSS) or Steam Assisted Gravity Drainage (SAG-D). 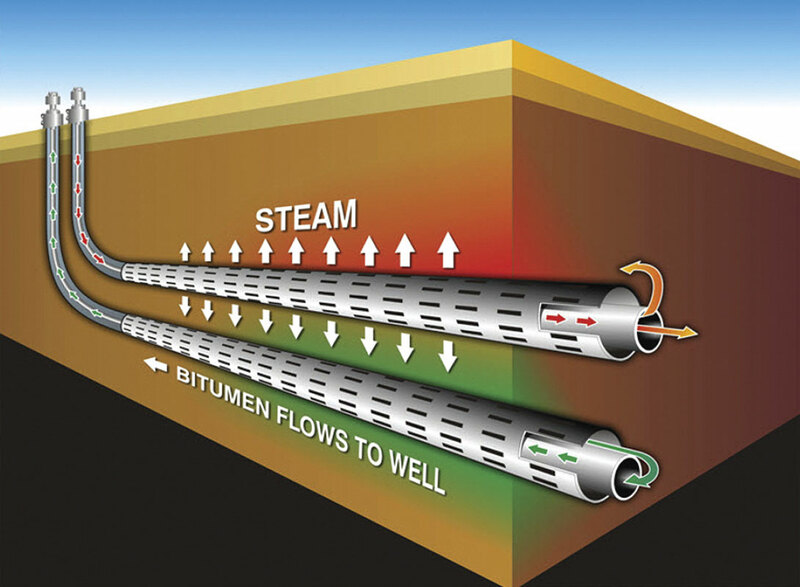 During CSS, a single well is dug vertically into the bitumen where steam of up to 300 degrees C is released to heat up the oil sands, and is then pumped back up through the same pipe. The whole process can take weeks to complete. During SAG-D, two wells are dug horizontally into the ground, one above the other. The upper well releases steam to lower the viscosity of the bitumen, which then flows to the lower well to be recovered (Fuel Chemistry Division Public Education and Outreach Committee). 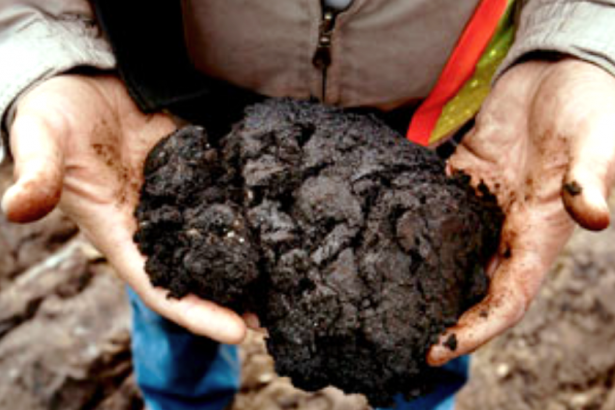 When located in the tar sands, bitumen is found mixed in with water and sand. Warm water is mixed with the uncovered bitumen and transported via a hydro-transport pipeline to a Primary Separation Vessel. This hot-water process for extraction was first conceived in 1920 by Dr, Karl Clark of the Alberta Research Council (Luhning). There, the Bitumen froth rises to the top while the sand makes its way to the bottom. This is possible because Bitumen is “hydrophobic” and prefers to attach itself to the rising air bubbles than the water molecules. It is then further processed to separate out the remaining sand and water, and is mixed with a solvent called Naphtha to assist in the centrifugal separation. Bitumen is then moved into hydrogen processors, or Cokers, which add hydrogen and remove carbon from the bitumen compounds to make it ready to use as synthetic crude oil (Syncrude Canada Ltd). Otherwise, some bitumen is combined with other unknown chemicals that are trade secrets to form diluted bitumen or Dilbit (Ramel). After the extraction process at the Coker, the bitumen then goes to other vessels during upgrading. This can then create more refined fuels like diesel and jet fuel. (Suncor Energy). During these extraction methods, by-products of the process are re-directed to tailings ponds. They are composed of water, sand, clay, and some hydrocarbons. The fine particles in these ponds settle slowly, eventually segmenting themselves, and the water is then recycled throughout the process (Lehning). These ponds are of great concern for environmentalists, because it has been shown that seepage into groundwater can occur, and fish and waterfowl become exposed to toxic chemicals (Truthloader). Tailings ponds have also been linked to adverse health effects on nearby populations. The ponds often contain arsenic, mercury and other toxins . While protocols for intercepting all of the water are in place, an Environmental Defense report found that 11 million liters of contaminated water are leaked per day, and opponents of the oil sands operation located at Fort Chipewyan are concerned their drinking water will be contaminated. One report notes that “a 2006 analysis of the health status of Fort Chipewyan residents showed that residents have elevated prevalence rates of diabetes, hypertension, renal failure, and lupus. All these diseases have been linked with one or more of the toxics commonly found in tailings pond water” (Tenenbaum). Bitumen is mainly transported via pipelines across North America. Problems arise when examining the safety, or lack thereof, of these methods. There is speculation that the chemicals used during refinement to help lower the viscosity of the bitumen and allow it to flow easier are also leading it to be more corrosive on the interior of the pipelines. It is still debated whether or not bitumen conclusively does erode pipelines at a quicker rate than conventional oil. One thing has been shown, though, and that is spills from bitumen pipelines have occurred 3.6 times more often than conventional oil pipelines between 2010 and 2012 (Biello). It can also be seen that when oil sands crude spills, it is significantly more difficult to clean up than conventional oil. As an example, the Kalamazoo oil spill in Michigan in 2010 still left 38 miles of the river contaminated by April 2013, with clean-up crews on site saying that tools and methods for cleaning conventional oil spills proved ineffective for the bitumen (Swift). Alberta Energy. (n.d.). Facts and statistics. Alberta Energy. API. (2013, March 20). Background on diluted bitumen. American Petroleum Institute. Bailey, D. (2014, February 26). Tar sands crude oil: Health effects of a dirty and destructive fuel. National Resource Defense Council. Biello, D. (2013, April 4). Does tar sand oil increase the risk of pipeline spills? Scientific American. Fuel Chemistry Division. (n.d.). Oil sands. Fuel chemistry division. Public Education and Outreach. Gray, G.R., & Luhning, R. (2015, April 10). Bitumen. Historic Canada. Luhning, R., & Gray, G. (2013, August 8). Bitumen. The Canadian Encyclopedia. Marshall, A.G. (2013, July 26). An anarchist understanding of the social order: Environmental degradation, indigenous resistance, and a place for the sciences. The Hampton Institute. NRDC. (n.d.). 10 threats from the Canadian tar sands industry. National Resources Defense Council. Oil Sands Discovery Center. (n.d.). Facts about Alberta’s oil sands and its industry. Oil Sands Discovery Center. Ramel Alex. (2015). Personal interview. Refined Bitumen Association. (n.d.). Bitumen history. Refined Bitumen Association. Regional Aquatics Monitoring Program. (n.d.). In Situ methods used in the oil sands. Regional Aquatics Monitoring Program. Schamel, S. (n.d.). Oil sands. American Association of Petroleum Geologists. Shell. (n.d.). Shell bitumen global locations. Shell Global. Song, L. (2012). A Dilbit Primer: How it’s different from conventional oil. Inside Climate News. Suncor Energy. (2012, June 13). How Suncor Energy gets oil from sand. Swift, A. (2013, April 3). Top 5 things you should know about transporting tar sands crude. Switchboard. Syncrude Canada Ltd. (2013, August 30). How we make oil at Syncrude. YouTube. Tenenbaum, D. J. (2009). Oil Sands Development: A health risk worth taking? Environmental Health Perspectives, 117(4), A150–A156. Truthloader. (2013, November 26). Canada's tar sands: The most destructive project on earth? Truthloader.